Thousands of men, women and children experience the absence or loss of facial tissues involving the eye, the orbit, the nose, or the ear. And now, hundreds of them from the United States and around the world confidently wear facial prosthetics created by Medical Art Prosthetics anaplastologists as they go about their normal daily lives. The confidence that people enjoy from knowing their facial prosthesis is secure and virtually undetectable is the greatest gift we can offer, and it extends to those who receive the same care and precision in the making of their finger, hand or other aesthetic prosthesis. This is a goal we have dedicated our talent, our clinical training and our facilities to full-time for over 3 cumulative decades as career facial anaplastologists. Our love of this challenge and our reputation for exceptional results and innovation has earned us the support of many returning clients and dental and medical specialists who see for themselves the merits of our unique commitment to specialization in facial and somatic prosthetics. Gregory Gion, MMS, CCA, BOCP, born and raised in Madison, Wisconsin, created America’s first dedicated independent practice in silicone facial and somatic prosthetics in Dallas, Texas in 1985. A second practice was established in Madison in 2005. Greg Gion continues 4 decades of setting the highest standards of excellence in cranial and extraoral maxillofacial prosthetics as well as aesthetic silicone restorations for the entire body. Ocular, orbital, nasal, auricular, hand and foot prostheses are created with such individualized care and precision that patients travel from around the world for the unbelievable results we are known for. The approach of Medical Art Prosthetics toward the creation of any craniofacial or somatic prosthesis involves medical, artistic and prosthetics expertise – none being more or less important than the others. Trained in basic medical sciences we understand involved anatomy to communicate with surgeons. Gifted as medical artists we call upon our visual acuity and artistic talent to synthesize and create what technology cannot. Dedicated to craniofacial prosthetics for over 30 years we offer the assurance of having designed, fabricated and fit some of the most innovative and aesthetic prostheses in the United States. 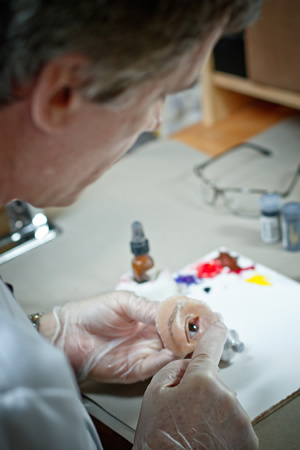 Medical Art Prosthetics has two main clinic sites in Madison, Wisconsin and Dallas, Texas. We also offer satellite locations across the country in Chicago, New York City, Los Angeles, Rochester (NY) and San Francisco. If you cannot come to us, we make every effort to meet our clients’ needs and can craft a prosthetic remotely.